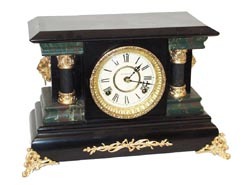 Waterbury Clock Co. mantle clock, "Denmark", ca 1906. Beautifully restored black enameled wood cased clock. 8 day, striking a gong on the hours, cup bell on half hour. The case is 14 inches wide, 11 inches high. The case is not only restored, the inside including movement is bright and clean. This clock is ready to use or sell. All the metal ornaments have been regilded-painted, and the marbleized pieces are clean as new, in fact the clock is clean enough to be new.